Kitchen Appliances Market size in 2015 was over USD 175 billion, and will exceed USD 250 billion by 2023. 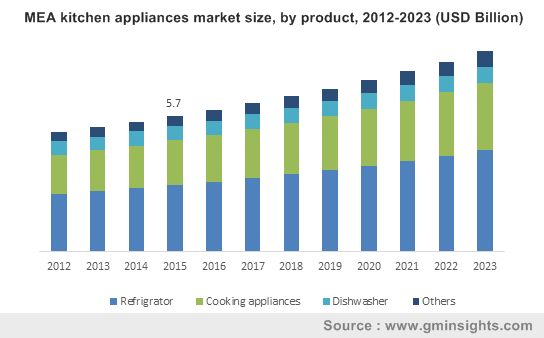 Changing household and commercial lifestyles, economical availability of electricity, rising concerns regarding ecofriendly appliances are expected to be the key drivers of the kitchen appliances market size. Development of ecommerce distribution channels, emergence of IoT and other smart technologies will support the overall kitchen appliances market share from 2016 to 2023. Traditional methods of cooking, conserving food and dish cleaning require tedious effort and time. Next generation population may not have the sufficient time to invest in these activities and may easily avail these alternatives, from retailers and vendors. This may act as a primary growth factor contributing to the global kitchen appliances market share. Environmental concerns regarding rising pollution and global warming has led to the development of appliance that are energy efficient. Technological advancements in accordance to this trend may help manufacturers garner huge gains over the forecast timeline. Moreover, regulatory bodies are expected to entertain such portfolio in the industry and may boost the current growth rate. High initial capital and maintenance costs are expected to negatively impact on the consumer inclinations towards the new device developments. Uneven economic developments in the rural areas of China, India, and Africa are facing electricity issues. Moreover, around 50% population in 38 of 49 countries in Sub-Sahara survive without electricity which will negatively impact the kitchen appliances market size. Rising number of e-commerce retailers, next generation device developments for increased consumer convenience, connectivity, and energy saving attributes are likely to present potential growth landscape. Ongoing rural electrification projects would also provide stable growth prospects over the long run for viable kitchen appliances market penetration. Household kitchen appliances market share is anticipated to grow at 4.3% CAGR over the forecast timeframe, with revenue in 2023 forecast to cross USD 150 billion. This can be attributed to the changing lifestyle in urban areas, and the considerable volume of already installed units. Refrigerators and cooking appliances are among the most essential components in domestic use, thus, is expected to grow at a steady rate over the coming years. Increasing number of restaurants, hotels and food line businesses are likely to aid the commercial kitchen appliances market size. Refrigerators contributed over 40% of the overall kitchen appliances market share and are forecast to witness growth at 4.7% till 2023. The need to conserve edible items in different temperatures is the key driver of this segment. Technology advancements to reduce the energy consumption, and its impact on the environment, along with smart operating features will consistently propel the industry augmentation. Cooking appliances market was valued at over USD 55 billion in 2015. The high expected growth rate can be attributed to increasing convenient portfolios offered by key players. North America contributed the largest share in 2015, owing to high penetration in the U.S. kitchen appliances market size. Industry has witnessed a significant paradigm shift over the increased adoption of cooking electronics. This is likely to present favorable growth landscape during the forecast timeline. Asia Pacific kitchen appliances market size is expected to register 5.1% CAGR from 2016 to 2024. The growth can be based on the increasing disposable income of the households and potential growth prospects. Key players in the kitchen appliances market include LG Electronics, Samsung Electronics, Whirlpool Corporation, and Haier. Other notable industry participants include Panasonic, Electrolux, Robert Bosch, Philips, etc. Since these products are found across the residential and commercial space, companies have been aiming to achieve product differentiation and an effective value proposition to beat the competition. These initiatives also include upgrades in equipment for addressing evolving consumer preferences. Maintaining product quality at a competitive price point ranks among the major strategic steps. The various components or parts required during the production process can be manufactured internally, or alternatively obtained from external or third party suppliers. This results in a considerable degree of vertical integration to drive profits and maximize revenue generation. The presence of a robust distribution network aids in business expansion and larger number of channels to reach the consumer. Similar to the overall white goods industry, the kitchen appliances market share benefits from strong aftersales services. Companies also focus on an attractive product portfolio to gain customer base. Marketing and related promotional activities represent the major strategies witnessed in the global ecosystem.